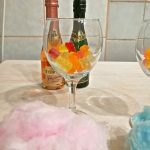 This New Year's Eve Cotton Candy Champagne is one of the most simple beverage you can serve on your party! It's fancy, colorful and delicious! Pour the champagne into two glasses. Add half of the frozen gummy bears to each champagne. Place the cotton candies on the top of the glasses. Push the cotton candies into the glasses when you serve them.